Another year, another USA Greco tour of Sweden, and another dual versus Team Skåne Brottning. Sound good? Tomorrow from Klippan, Sweden, a group of US age-group Greco-Roman athletes will once again be taking on host club Team Skåne Brottning. For the Americans, there are several with previous experience at these duals. 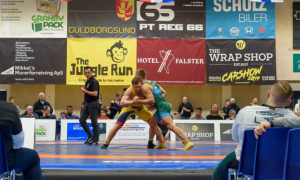 Despite still being in high school, this is old news for Logan Hatch (67 kg, WI), who is making his third overseas Sweden dual appearance. 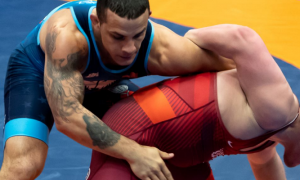 Ditto for Britton Holmes (67 kg, NMU/OTS), whose 1-0 victory over Elias Andersson last year was pivotal for a US squad that wound up emerging victorious against Team Skåne Brottning for the very first time in the dual’s albeit short history. Of course, there is also 2018 Cadet World Team member Dominic Damon (67 kg, WA). It came down to the last match a year ago and Damon pulled through in the clutch to storm past Zackarias Gustavsson via tech. The Americans have a group of other extremely tough competitors stepping into action tomorrow. Youngster David Stepanian (60 kg, NMU/OTS) just grabbed a third at Saturday’s Klippan Cup for his first international medal. He will be meeting Fabian Frisk (TSB). High-profile Tommy Dantzler (82 kg, Front Range Twisters), also in the midst of his first European tour, takes on an athlete sporting significant experience in Anton Olsson (TSB). Olsson competed as a Senior this season and counts a silver at the Nordic Championships among his accomplishments. Ryan Cummings (72 kg, NMU/OTS), like Damon, is no stranger to engineering a tough win that makes a difference. In 2017 at the Superior Camp dual opposite Team Sweden, Cummings gritted out a criteria victory that helped put the US over the top. The dual meet is set to begin at 7:00pm Swedish time (1:00pm EST). As of now, live streaming information is not confirmed. If/when it is, we will update appropriately.